Why Bellevue? What about Redmond or Renton? Last month at a conference in Bellevue at the Meydenbaurer Center, I had the great pleasure to meet John and Sarah Payson, two forward-thinking, tech-savvy Realtors that are contagiously-passionate about Bellevue Real Estate. After spending two days with them and getting introduced to their website and Living the Bellevue Life blog, not only was I convinced that my family and I are moving to Bellevue, but it was clear that they were experts in the Bellevue Real Estate market as well as the community they live. As a Bellevue area mortgage banker, I respect the fact that the Payson’s have “undressed” a long-time myth in the Puget Sound community that, “You cannot purchase a home in Belleuve under $300,000.” Well, by clicking on the image/link above, you will see that you can buy a home in Bellevue for under $300,000. More importantly, there are down payment assitance programs available in Bellevue to purchase many of these homes for Zero Down (a first time homebuyer only program). For more information on the Bellevue Zero Down Mortgage Program that I mentioned, I can be reached at dan.mortgageadvisor@gmail.com or you may visit my Bellevue Down Payment Assistance Blog to gather more information on this great mortgage program. 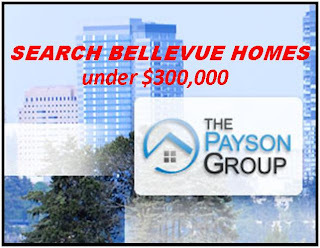 I encourage you to Experience the Bellevue Life with the Payson Group. I have, and it was GREAT!